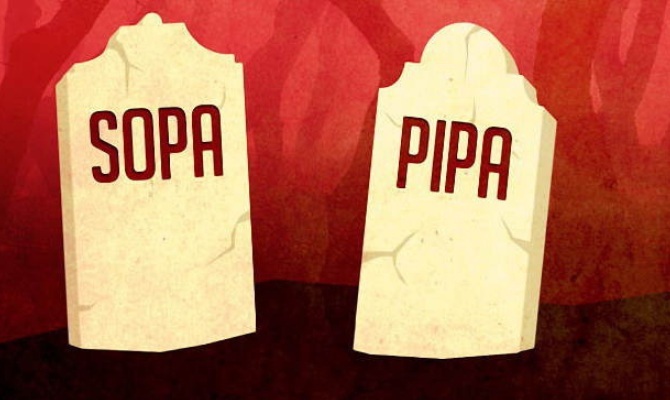 Former Senate & MPAA Chief Said -SOPA & PIPA "are dead, they're not coming back"
It seems that the mass protest against controversial act SOPA & PIPA finally succeed. Former Senate Christopher Dodd, now chairman of the Motion Picture Association of America, said the Stop Online Piracy Act and Protect IP Act aren’t going to be floated again in Congress. In an interview after an appearance at San Francisco’s Commonwealth Club Tuesday night, Dodd told “My own view, that legislation is gone. It’s over. It’s not coming back,” Still, he said the massive protest against the measures, which included online petitions and massive e-mail campaigns, “was over the top.” SOPA, the more draconian of the two failed bills, would have required ISPs to prevent Americans from visiting blacklisted sites by altering the system known as DNS that turns site names like Google.com into IP addresses such as 174.35.23.56. Instead, for the blacklisted sites, ISPs would have had to lie to their customers and tell their browsers that the site doesn’t exist. SOPA and its sister bill PIPA were both definitively killed off earlier this year after an overwhelming campaign of online action by citizens and tech companies. Dodd sounded chastened, with a tone that was a far cry from the rhetoric the MPAA was putting out in January. "When SOPA-PIPA blew up, it was a transformative event," said Dodd. "There were eight million e-mails [to elected representatives] in two days." That caused senators to run away from the legislation. "People were dropping their names as co-sponsors within minutes, not hours," he said. "These bills are dead, they're not coming back," said Dodd. "And they shouldn't." He said the MPAA isn't focused on getting similar legislation passed in the future, at the moment. "I think we're better served by sitting down [with the tech sector and SOPA opponents] and seeing what we agree on." Dodd also continued to laud the "six strikes" plan that US Internet providers have agreed to enforce on behalf of the entertainment industry, insisting that it's an "educational" program aimed at illegal downloads. "If people are aware they're downloading illegal content, they'll go to a legal service," he said. "It's an experiment to see if we can get cooperation. It's not a law—you don't go to jail." The MPAA won't have any kind of back-door to subscriber records at Verizon or other ISPs, Dodd said.